North Fork Maquoketa Headwaters is a 27,727-acre subwatershed of the 592-square-mile North Fork and 1,879-square-mile (1.2 million acres) Maquoketa River basins. 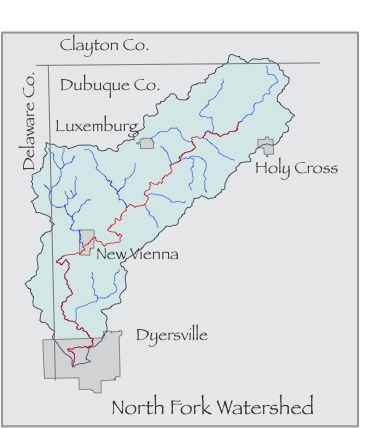 Originating in Clayton County north of Holy Cross and Luxemburg and flowing through New Vienna, the watershed is 0.78 percent urban, 94.5 percent agricultural and 4.7 percent woodland. North Fork Maquoketa River watershed north of Dyersville, Iowa. The North Fork from section 18, Concord Township, in Dubuque Co. to its confluence with Bear Creek is listed on Iowa EPA Section 303(d) impaired waters list (Part two – one or more pollutants and Part five – biologically impaired). The 2002 Iowa Department of Natural Resources Section 303(b) water quality assessment report identifies that aquatic life uses are “not supported”, based on numbers and types of macroinvertibrates and fish species collected. The watershed ranks near the highest of 25 similar-size Maquoketa subwatersheds for delivery of sediment, phosphorus and bacteria in Iowa DNR and Maquoketa Alliance-coordinated monitoring. The project builds on a Natural Resources Conservation Service (NRCS)-sponsored Conservation Innovation Grant (CIG) in Coffee Creek watershed (Coffee lies within the North Fork Headwaters watershed just north of New Vienna). The CIG project used a performance-reward approach to manage water quality, which allowed producers to evaluate their own farms using the Phosphorus Index and the fall cornstalk nitrate nitrogen test and then decide which management practices to use (such as reducing tillage, installing waterways, etc.) to reduce nutrient and sediment delivery. Coffee Creek was a collaborative effort with the University of Vermont to compare performance-based projects in Vermont and Iowa. Based on what they learned through the CIG project, the Coffee Creek Watershed Improvement Association, an Iowa non-profit group, applied for an Iowa Watershed Improvement Review Board (WIRB) grant in 2008. The Coffee Creek CIG project was limited to 13 cooperators and a WIRB grant allowed expansion of the performance-incentive program to a target of 40 farm operators, or 60 percent of the watershed. The grant also allowed monitoring and habitat evaluation at three sites in the watershed; similar monitoring continues in adjacent Hewitt watershed. Conservation education is the most important achievement of the first year of the North Fork Maquoketa River Headwaters watershed project, according to David Krapfl, chairman of the North Fork watershed citizens council. “Conservation measures don’t cost, they pay. I think there would be unanimous agreement that conservation pays,” Krapfl says, and the biggest accomplishment of the project is showing people that conservation pays. Krapfl has a 190-acre dairy farm in the Coffee Creek subwatershed of the North Fork Maquoketa Headwaters watershed. He’s also familiar with education efforts in Dubuque County and has been involved in a number of watershed efforts in the county, including working with the Soil Conservation Service and scouting in a watershed north of Dubuque. Conservation education is “getting people to become more aware of what they can do,” Krapfl says. The North Fork Maquoketa River Headwaters watershed project in Dubuque and Delaware counties in April 2008 received approval for their grant request for $406,000 from the Iowa Watershed Improvement Review Board (WIRB) for a three-year water quality improvement project. The project started July 1, 2008, and addressed nitrate-nitrogen and phosphorus delivery, periodic ammonia impairment and sediment delivery, as well as downstream flooding in the watershed. Flooding is a concern in the watershed because Dyersville suffered severe flooding six times since 1924, including twice in the last decade. Land use in the watershed is largely agricultural, with 70 percent row crops and most of the remainder (23 percent) in hay fields, pasture and CRP. There is a large livestock population – 2007 estimates were 5,300 beef, 1,500 dairy and 31,200 hogs. Project goals were to improve performance indexes by 15 percent and reduce residual cornstalk nitrate N by 40 percent, and reduce sediment delivery by 7,500 tons per year. The project is structured around a resident council, made up of producers living in and/or operating land in the watershed. Iowa State University Extension’s Performance-based Watershed Projects staff offers technical assistance and the Upper Iowa University biology department does regular water quality monitoring in the watershed (as well as neighboring Hewitt-Hickory). The council works informally, meeting primarily in the summer and winter. A dozen to 20 producers regularly attend the meetings. Using the technical help and monitoring information as well as their own production experiences and knowledge of the watershed, council members each year decide on a set of incentive practices to offer program participants. For example, first-year program offered four incentives for addressing the P-index, (such as reducing the farm’s P-index), three for the soil conditioning index (such as an incentive for increasing the SCI, which measure the soil’s productivity), and three for N performance management. There were also incentives for manure application calibration and analysis, fall cover crops and managed grazing. Most incentives are relatively small, in the range of $50 to $300, aimed at encouraging participation. There are also two performance bonuses for participants. What do participants think about the project? And have they changed their farming practices as a result? At an early summer meeting, a number of first-year producers briefly explained their participation as an extension of current farming practices. Ernie Goebel’s farm is one mile south of Luxemburg. As a kid, he says, he remembers catching fish in the creek. He heard of the project through his neighbors and takes part because he considers himself a proponent of getting and keeping water in the creek clear. He added that 90-95 percent of water issues could be avoided by using common sense. Earl Hosch lives in Coffee Creek subwatershed and has been involved with council since the beginning. He, too, is interested “in keeping the water clean” and has changed his activities to do less tillage and try to use less fertilizer. Gary Willenborg reworked every waterway and did some work on his filter strips on land he farms within the watershed in the spring. He became involved when others talked to him and the ideas seemed reasonable, he said, and is trying no-till. “It looks okay,” he says, with a little pride. Another resident from the north end of the watershed, LaVerne Tauke, raises hogs and heard about performance projects from his brother who farms in the Hewitt Creek watershed. He was already doing no-till so he thought his farm fit into the project. And, he explains he’s added some new practices as a test – he’s used less N this year and is curious about yield and cornstalk nitrate tests in the fall. WIRB funding for the North Fork Watershed Project ends in 2011. However, in June 2010, the USDA announced that Dubuque and Delaware SWCD would receive $5.4 million as part of the Mississippi River Basin Initiative. The funds will be used over five years for programs in Hewitt, Bear and North Fork headwaters of the Maquoketa River.